We split Monday’s plays in an up and down emotional day. We lose game 1 with the Yankees under; a game which had 6 runs scored in the first 3 and a half innings, only to result in 5 and a half shutout innings after that. We make amends for it with a late come from behind victory in Chicago. Asdrubal Cabrera has hopefully broke out of his early season woes (he’s on my fantasy team) with a game winning 2 out 2 run single in the top of the 8th to go up 3-2. Just one play for Tuesday. We go back to the Cleveland/Chicago series for a second consecutive day. These two teams have met 4 times so far this year, hitting 3 of 4 on the under (covering by 3.5, 4, and 6.5 runs). Chicago has been struggling to score runs of late averaging less than 2 runs per game in their last 4. Cleveland seems to be scoring in bunches. They’ve scored 3 or less in 3 of their last 5 with the other two coming against Houston Astros pitching (which isn’t saying much considering I saw a stat today in which I believe no starter has made it passed the 6th inning for them in like their last 7 games). Both young pitchers have started off their 2013 campaign hot as well. Even with a 1-2 record, Zach McAllister bolsters a 3.12 ERA. He is however 2-0 in 4 starts against the Sox with a 2.66 ERA. In his young career, he’s historically pitched much better on the road vs at hime with a split ERA of 3.30 away to 4.98 at home. 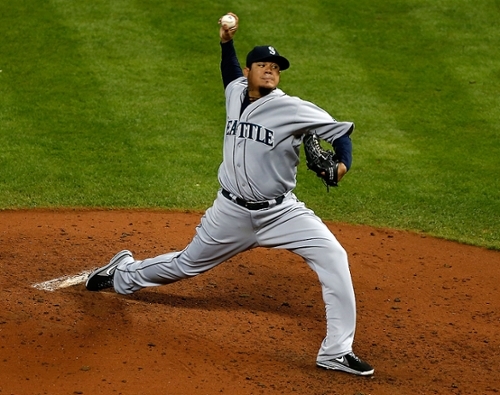 Quintana is coming off of 2 straight with no earned runs allowed (one was against Cleveland last week). He’s got a 2.55 ERA with one win on the year. Both have favorable batter/pitcher heads up matchups. I’d prefer this one at 8.5, but it’s never going to get there. If you’re not fast enough in betting this one, it may drop to 7.5 by game time. After another exciting year of basketball, David & James are tackling the hottest questions. Predictions on all NBA awards!! 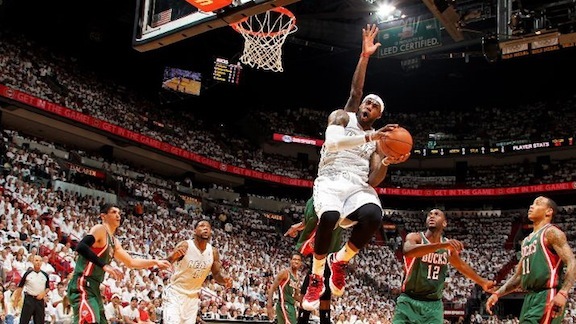 David: LeBron James (MIA) – The obvious choice. Chris Paul should also be noted, the Clippers would be nowhere without him, but it’s hard to argue with the season LeBron and the Heat have had. James: LeBron James (MIA) – I don’t think you can go with anyone else. Melo and Paul might take a vote or two but LeBron is the most complete player we have ever seen. David: Damian Lillard (POR) – Led all rookies in scoring and assists while providing the Blazers with another legitimate threat alongside LaMarcus Aldridge to build for the future. He is an up and coming star to watch. James: Damian Lillard (POR) – Lillard was an absolute monster for the Trail Blazers this year. He was brilliant scoring and passing the ball. I think we have a star! David: J.R. Smith (NYK) – Led all 6th men in points per game at 18.1 (a new career high for him) and provided a much-needed spark down the stretch for the Knicks. 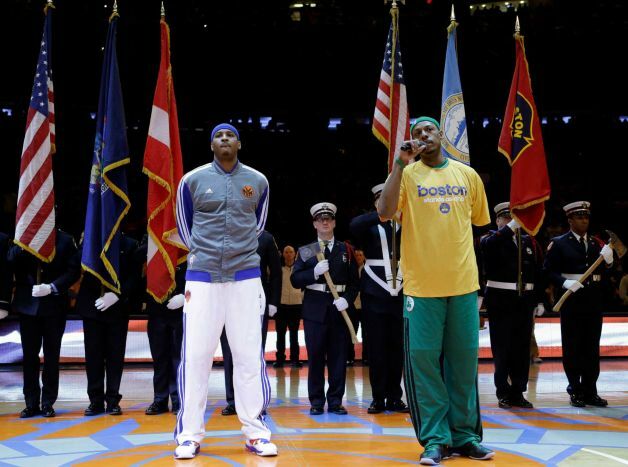 James: J.R. Smith (NYK) – David and I agree 3 for 3 thus far. Smith came into the season with a new attitude and it showed. Smith has always been a score first player, this year he learned how to be more efficient. It should be added that Jamal Crawford was the run away leader at the all star break. David: Larry Sanders (MIL) – Finished 2nd in the league in blocked shots (2.83 bpg) and 12th in rebounding (9.5 rpg); better player than many expected him to be coming out of VCU. James: Serge Ibaka (OKC) – I may be alone in voting for Ibaka, who should have won the award last year, but he was yet again a monster on defense. David: James Harden (HOU) – We all knew he had superstar potential, but a 10 ppg increase in only 7 additional minutes per game on a new team showed the world just how good he is, not to mention averaging nearly 6 assists and 2 steals per game. James: Paul George (IND) – I am with David on voting for Harden but George finally showed what he was made of. 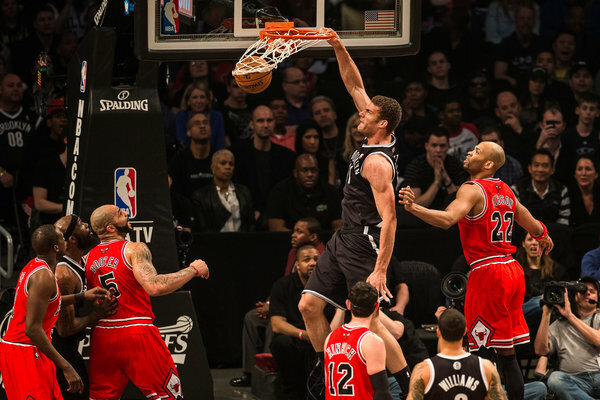 He played outstanding this season and even had some great games against Lebron James. David: George Karl (DEN) – The Nuggets (57-25) finished one game out of 2nd and 3 games out of first in the Western Conference. With that roster, no one saw that coming, but their entertaining and hard-working style ran teams off the court at times this year. James: George Karl (DEN) – I am just echoing David. Karl had his boys playing team ball week in and week out. David: Los Angeles Lakers – All of the hype coming into the season was foiled by injuries, coaching changes, and a lack of chemistry. 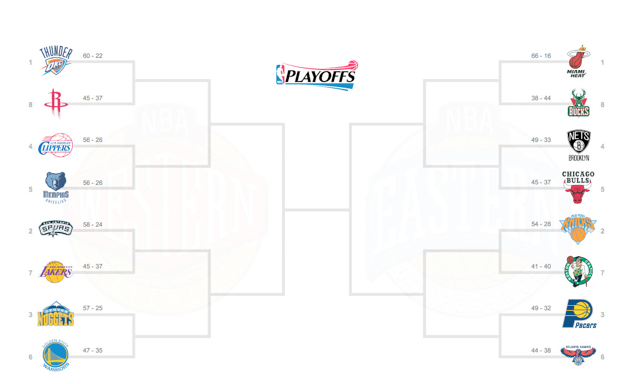 They are lucky to even be in the playoffs and are a lock for a first round exit without Kobe Bryant against the Spurs. James: Los Angeles Lakers – This is the only choice. My NBA Championship pick (you would think I would learn teams dont win in the offseason) flopped. I don’t think anyone saw this coming. David: The Spurs have done it again – Year after year they appear to be too old, not enough support around their big 3, etc. Yet here they are again, 2nd in the Western Conference, and primed for a playoff run if Manu Ginobili can get healthy. James: The Clippers Win the Division – Last year, Chris Paul helped the Clippers turn the corner. This year, he took them to another level. 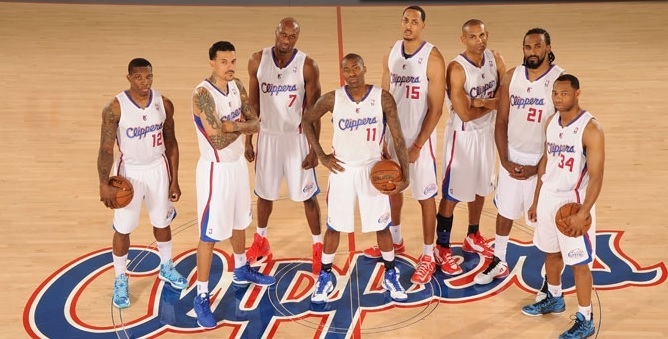 Lob City was tremendous to watch this year. They are talented, deep and just so fun to watch. 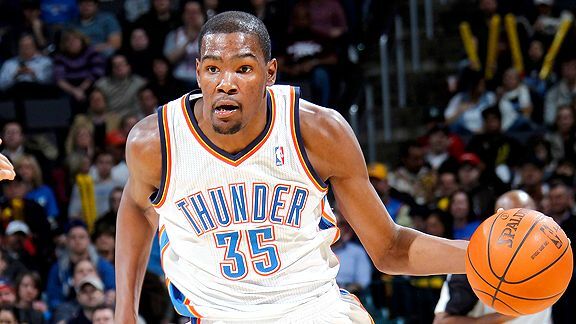 David: Miami Heat v Oklahoma City Thunder – Miami in 5, could even be a sweep. 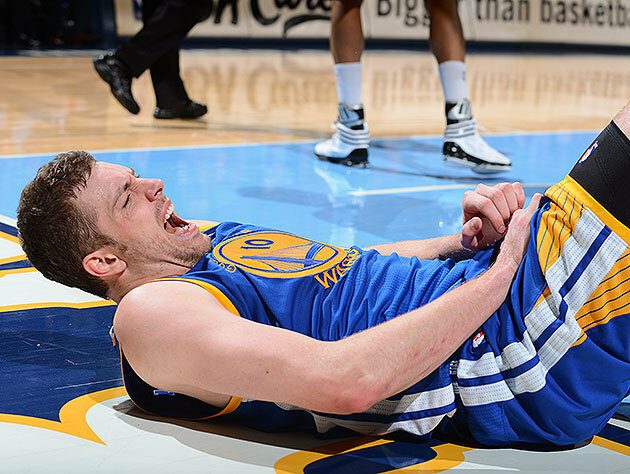 Securing home court allowed their bench to get in rhythm and their starters to get healthy. A repeat for the Heat is all but a guarantee. James: Miami Heat v Oklahoma City Thunder – Thunder in 7. I don’t really see anyone beating the Heat 4 times but maybe this is wishful thinking. While they might be missing Harden (maybe a little), Durant and Westbrook have both elevated their games.